Another day, another GPS device. Mio Technology recently unveiled the latest addition to its DigiWalker GPS line, the Mio DigiWalker C230. The Mio DigiWalker comes with preloaded maps and real-time text to speech directions. Mio is marketing the DigiWalker C230 as an entry level GPS which means nothing fancy is added on to the device, just a straightforward GPS with a pretty affordable price. 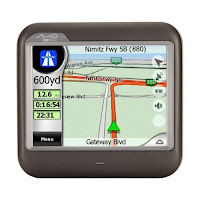 The Mio DigiWalker C230 GPS has a 3.5 inch TFT touch screen with 65k colors. The Mio DigiWalker C230s’ display also features a bright backlight with anti-glare and the GPS device supports 16 different languages including English, French, and Spanish. Other features and specifications of the Mio DigiWalker C230 includes: 20 SiRFstarIII GPS Receiver Channels, WAAS Enabled, on-board 1GB NAND flash memory, SD/MMC Memory Expansion Module, 800 mAH Li-ion battery, USB 2.1 connectivity, weighs 144g, and has dimensions of 3.54" x 3.30" x 0.94".